Leopard Geckos (Eublepharis macularius) how to buy tutorial. How do I interpret the information presented? Listed are photos of leopard geckos currently offered for sale at the Gecko Ranch. What you see is the gecko you are actually purchasing! Group numbers and or names of the parentage of the leopard geckos are listed. This is for your reference in case you decide to purchase more in the future. You may want the same parentage for the same look or different parentage (strongly recommended) for breeding. The hatch date and gram weight of each leopard gecko is listed with the gecko's photo. Geckos offered are either well-started juveniles (one month or older) or adults (one year or older). Why do some leopard geckos cost more than others? Prices of leopard geckos are determined by desirability of color and pattern. Some colors and patterns are harder to produce which also cause them to be more expensive. How do I select one or two? Beginner: Select any individual leopard gecko, male or female. You may select two if you choose two well size and age matched females (two males will fight). They should have hatch dates that are close together - I will tell you if they are a good size match also. Selection of a breeding pair is not recommended for beginners; get to know and enjoy them first and then decide if breeding is for you. They are prolific breeders! What do I need for my leopard gecko? Leopard Gecko Packs with much of what you need can be ordered with your leopard gecko. Keep scrolling down the Online Leopard Gecko Store page to order them. What can expect from Gecko Ranch once I order my leopard gecko? An extensive care sheet will be sent to you via e-mail as soon as your order is received. It is critical that you read and follow those instructions. Julie will contact you personally and set up a shipping date. View detailed shipping and ordering information. 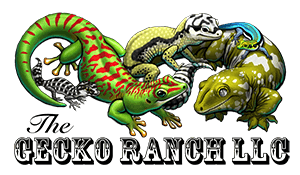 Gecko Ranch is here to answer your questions and help you as long as you own your leopard gecko purchased here! Please take advantage of my 25 years of experience with leopard geckos!